For a quick energy boost at work, nourishing snacks are essential. Accredited Practising Dietitian Stefanie Valakas shares a few of her favourites. Plain, unsalted, roasted or raw nuts and seeds are desk drawer essentials. They’re packed with the right balance of protein, heart-healthy fats and dietary fibre to keep hunger at bay and power you through the afternoon. However, they are also energy-dense and can be easily over-eaten. I recommend keeping a large bag at home and portioning out a small handful a day into a separate container to take to work with you. Stock up on a few pieces of fresh fruit to provide you with hydration, a boost of carbohydrates to keep your brain firing, and a whole host of essential vitamins and minerals, as well as antioxidants. A simple banana, apple or orange can help keep those sweet cravings away when 3:30-itis strikes. If you have access to a fridge or freezer at work, keep fruit cool to extend its shelf-life. Stock up on some frozen berries or other fruits to add to breakfast cereal or Greek yoghurt and take your work snacking to the next level. If you enjoy savoury and crunchy snacks, you’ll love snacking on roasted chickpeas or fava beans. Legumes and beans are nutritional powerhouses filled with plant protein, fibre, resistant starch and iron. They also have a low glycaemic index (GI), meaning they’ll be more slowly digested, leading to longer-lasting energy to get you through your busy day. To prepare, simply rinse some tinned legumes, dress with your favourite herbs and spices and bake in the oven. Keep them in an air-tight container in your drawer for when you get peckish. You can also pick up some pre-packaged roasted chickpeas and fava beans from the supermarket. 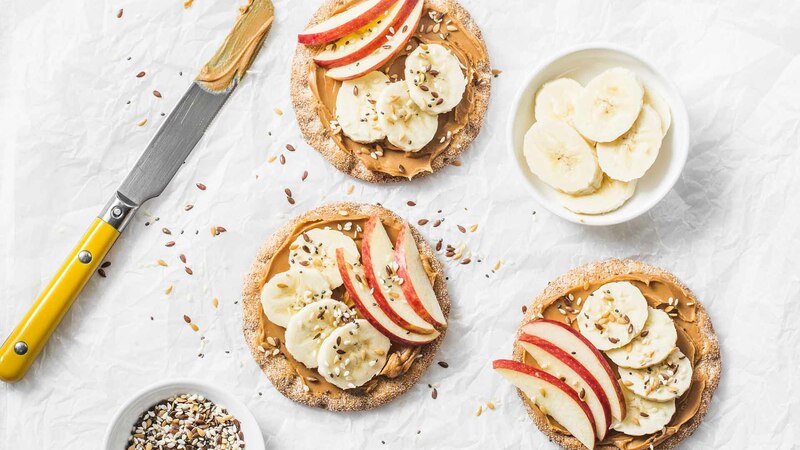 A few wholegrain crackers or rice cakes with 100% nut butter (such as peanut, almond or cashew butter) can really bust those hunger pangs. The combination of healthy fats, proteins and carbohydrates, as well fibre and a hit of B vitamins, will give you that boost of vitality at work. Plain, unsalted popcorn is a low-kilojoule and nutritious snack, packed with fibre to keep you full. Just like nuts, it can be easy to overdo it with the portions, so separate it into containers or pour into a small bowl. A good muesli bar can be a convenient and nourishing packaged snack to keep handy in your desk drawer. Choose one low in added sugar (less than 5 g per bar) and filled with nuts, seeds and wholegrains to fuel your work day. This a great option for morning tea before lunchtime sport or a gym session, as they’re filled with satiating protein, fibre, healthy fats and just enough carbohydrates to satisfy that sweet craving. Stefanie Valakas is an Accredited Practising Dietitian from Sydney, providing evidence-based nutrition information to her clients and via her blog, The Dietologist.